I jernalderen begyndte mennesket tilvirke jern i større omfang. Den ældste udvinding af jern skete i det 2. årtusinde fvt. i Anatolien og Mellemøsten. Being the world’s first political rule to adopt an imperial structure. The Via Maris that constituted an important passage for movement of people and commodities was decisive for the region’s role. The Assyrian expansion toward the west was undertaken systematically in the days of Tiglath-pileser III (745-727 BCE), when Assyria penetrated and increased its control over the territories west of the Euphrates River. 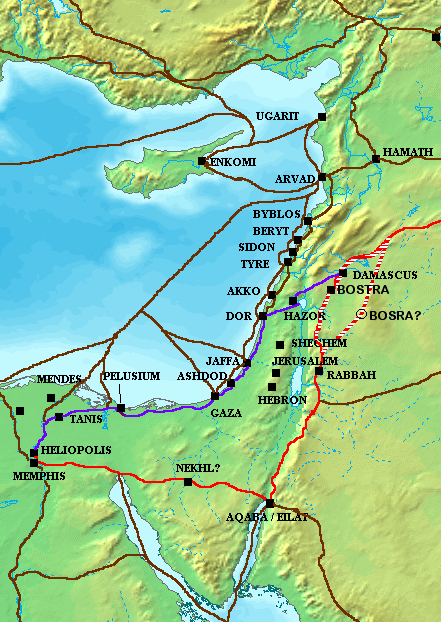 Via Maris - "way of the sea"
Via Maris is the modern name for an ancient trade route, dating from the early Bronze Age, linking Egypt with modern day Iran, Iraq, Israel, Turkey and Syria. In Latin, Via Maris means "way of the sea." Levantine trade routes, c. 1300 BCE. Enkomi is a village near Famagusta in Cyprus. It is the site of an important Bronze Age city, possibly the capital of Alasiya. The Mining industry of Cyprus is synonymous with copper extraction which began around 4,000 BC. The ancient Cypriots were not only experienced miners but also skilful metallurgists. The mining history of Cyprus has connected the name Cyprus, with the name of copper (Cuprous).